May is Preservation Month, a time to celebrate places that matter to you. On May 6, I led a Jane’s Walk, “Ridge Avenue Stroll through Philly’s Jazz History.” The first stop was the legendary Blue Note. The Ray Bryant Trio was the Blue Note’s house band. Interestingly, Bryant co-wrote the smash hit, “Madison Time,” which was released in 1959. 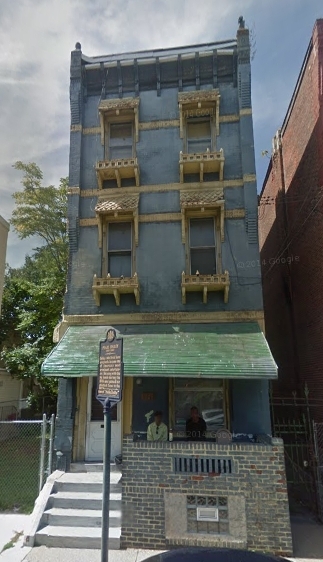 The highlight of the stroll was 2125 Ridge Avenue, the former location of the Checker Café, a “black and tan” (read: racially integrated) jazz club. The nightclub’s motto was “Good Food. Good Cooks. Good Service.” One of the servers was a teenage singing waitress named Pearl Bailey. Since October 2016, I’ve been locked in battle with the Philadelphia Housing Authority which wants to demolish the building that has been a visual anchor for more than 100 years. The Pennsylvania Historical and Museum Commission agreed with me the building is of historical significance. Last week, PHA signed a programmatic agreement that saves the building for now. Under the agreement, PHA must stabilize the building. I say for now because PHA has made it clear it wants to demolish the building. I guess it doesn’t fit their “vision” for a revitalized Ridge Avenue. In an area full of vacant lots, PHA wants to replace a building that is eligible for listing in the National Register of Historic Places with yet another vacant lot. I encouraged the 40+ people who participated in my Jane’s Walk to make some noise and tell decision-makers that this place matters. If you care about preserving Philadelphia’s cultural heritage, DM me on Twitter or send message to phillyjazzapp[@]gmail.com. The influence of Harlem and the legendary Cotton Club with its extravagant floor shows of light-skinned chorus girls are noted in the previous descriptions, as well as the naming of the Ridge Cotton Club along the Ridge Avenue entertainment district. In addition, the ubiquitous title of café such as Art’s Café, Pocahontas Café, Hy De Ho Café and The Roseland Café implied inspiration from Europe and the desire to accentuate superior social mingling. In a 1996 interview with the Philadelphia Inquirer jazzman Jimmy Oliver recounted that he used to play at Irene’s Café whose regulars included Pearl Bailey. James Henry Oliver was a tenor saxophonist and bandleader based in Philadelphia. Active from the mid-1940s, his bands, including the house band at local venues, featured, among other musicians, Philly Joe Jones, Steve Davis, Red Garland, Johnny Coles, Charlie Rice, Sam Reed and Mickey Roker. He has been cited as one of several sax players who influenced John Coltrane. Turning down the temptation to work in New York, he preferred to play locally in Philadelphia, alongside local jazz stars such as Bootsie Barnes, the Heath Brothers and Philly Joe Jones as well as visiting stars Charlie Parker, Pearl Bailey and Max Roach, and, especially around 1946-47, while in residence at the Zanzibar Café, he was noted for playing “against” visitors Lester Young, Coleman Hawkins, Ben Webster, Dexter Gordon, Illinois Jacquet, Arnett Cobb, George Auld and Charlie Ventura. Popular in the mid ‘90s, Mr. Chip’s Bar was located at 22nd Street and Ridge Avenue. I looked over there and thought to myself that it only took me 50 years to get across the street. Oliver was a regular at Irene’s, along with Pearl Bailey. On Saturday, Aug. 15, 2015, Beech Community Services will present the 9th Annual “Jazz on the Ave.” The free community festival will stretch along four blocks on Cecil B. Moore Avenue, between Broad and 17th Streets. Each year, this concert continues to grow with thousands attending from the Tristate area and beyond. From local celebrities, like Bernard Hopkins, to longtime community members, this concert continues to be one of the must attend summer concerts of the year. During Philly’s jazz heyday, the “Ave” was known as Columbia Avenue. The four blocks were part of “The Golden Strip,” which stretched from 8th Street to 23rd Street. Columbia Ave. was chock-a-block with jazz joints, including such legendary spots as Cafe Society, Watts’ Zanzibar and the Web. For festival updates, follow Jazz on the Ave on Twitter, Instagram, and like them on Facebook. In 1946, Bailey made her Broadway debut in St. Louis Woman, a musical written by Harold Arlen and Johnny Mercer. The Pearl Theatre opened in 1927. It closed in 1963 and was demolished circa 1970. The Pearl Theatre was a notable jazz and dance venue and had a glamorous reputation among the rich and famous. In 1931 the Nicholas Brothers played here. Duke Ellington, John Coltrane, and many other prominent jazz ensembles of the period performed here. Bennie Moten and the Kansas City Stompers’ featuring Count Basie on piano performed at the club in November 1931, and in December 1932 the audience raved all week about their “Moten Swing”; the doors of the theatre were let open to the public who came crammed into the theatre to hear the new sound, demanding seven encores on one night. Pearl Bailey was discovered at the theatre in which she entered the theatre’s amateur song and dance contest and was paid $35 a week to perform there for two weeks but the theatre closed during her engagement and she wasn’t paid. The “Hi De Ho Man,” singer and bandleader Cab Calloway, played here in September 1931. 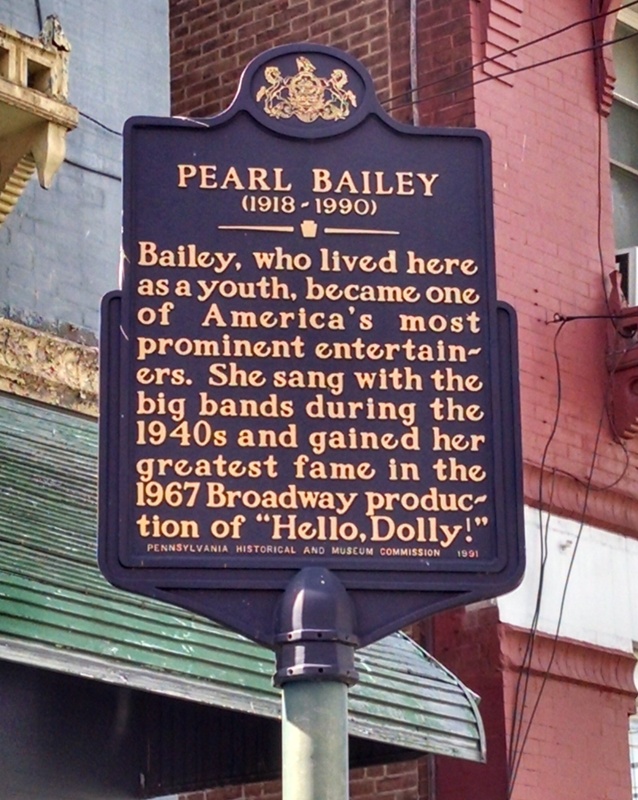 Pearl Bailey grew up in North Philadelphia in the 1920s and ’30s. Her family was part of the Great Migration from the South. She began her storied career by winning an amateur song and dance contest at the Pearl Theatre, which was located on the Ridge Avenue jazz corridor, a few blocks from the Golden Strip. After she hit the big time, Bailey bought the house on N. 23rd Street for family members who had migrated from Newport News, Va., where she was born. The current owner, William Sharrock, shared that overnight guests included comedians Redd Foxx and Slappy White, Bailey’s ex-husband. She opened the house to friends because African Americans were barred from hotels that catered to white guests. The Pearl Bailey House has been visited by, among others, Bon Jovi and Bill Clinton (yes, that Bill Clinton).